Do you have 2 cups of sourdough starter out at room temperature? Guess what — you can make whole grain sourdough waffles right now! These waffles are delicious, quick, easy, and nutritious! If you have your sourdough starter, you can whip them up at a moment's notice. We love to top ours with homemade yogurt, fresh fruit, and a slight drizzle of maple syrup. My boys also love eating them plain or toasted as a snack, treat in the car, or occasionally as the bread for their sandwiches. For a video demonstration of this recipe, check out our Sourdough eCourse. Adapted from Simply Sourdough: The Alaskan Way. Makes approximately 8 large waffles. Plug in waffle iron. It should be hot and ready to go by the time you have finished making your batter. In a bowl, combine melted but not too hot butter, salt, eggs, and, if desired, the sweetener, flax, vanilla, and cinnamon. Whisk until batter is nicely combined. Add starter. Cut it in and stir it with the whisk until incorporated. In a little cup, combine baking soda and water. Stir and then add to batter. Whisk 4 or 5 times, quickly. The batter will look pillowy. Open up your hot waffle maker and pour batter on it. Experiment to find the perfect amount — it's all part of the waffle-making fun! Finally, place your finished waffle on a plate and gussy it up a bit! Homemade raspberry sauce and fresh whipped cream sounds heavenly to me! These waffles keep in the fridge or a week, or freeze beautifully. Just pop in the toaster, top with your favorite goodies, and enjoy your very own “You Are Special Today” breakfast! For chocolate waffles, add a tablespoon or so of cocoa powder to the batter as well. Or, in the mood for a savory treat? Add cheese and herbs instead of sweetener! Top with homemade chili, bean soup, or a creamy sauteed veggie dish. 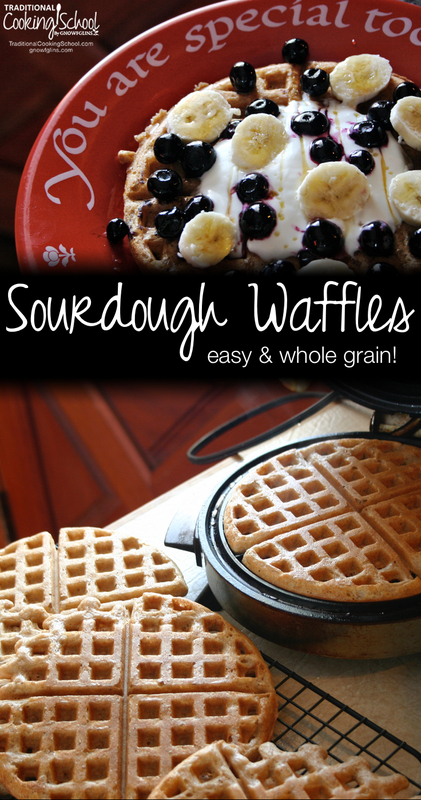 Do you make and love whole grain sourdough waffles? Oh, I LOVE the savory idea! I might have to try this tonight with the leftover spaghetti meatsauce from the other night… oh wait, I don’t have sourdough starter, and I don’t have a waffle iron. Hmm… My Kitchen Gadgets Wish List is getting longer and longer, and I am itchin’ to go on the sourdough lesson in the ecourse! We did do a skillet dish last night that would have been good over a savory waffle–I’m thinking maybe even sundried tomato and basil waffles? Would have been an excellent offset to our random skillet of sauteed veggies & chicken (which we did over quinoa). Of course, the butter-and-syrup-and-fruit-and-lots-of-raw-whipped-cream one will forever be the old standby! Thanks Erin & Wardee, for another inspirational post! Thanks for another amazing recipe. Can’t wait to try it. I have more than 2 cups sourdough starter in my fridge right now. Need to get it out!! I made these waffles this morning. The are DELICIOUS!! You have to try them!! I don’t see any flour in this recipe….did I miss it? Do you add the sourdough starter to the first mixture? I think we’re going to have this for dinner tonight. I am going to throw in some chia seeds instead of the flax, I ‘ll let you know how it goes. Kelli – Erin clarified the directions above to specify when she adds the starter. You can also add it in the first step with everything else. We just had these for breakfast and they were delicious! Thanks for sharing such a quick and easy recipe. 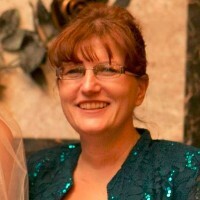 .-= Millie @ Homespun Oasis´s last blog post… Food Freedom =-. These are wonderful! I doubled the recipe and added 1 Tbsp. chia seeds. You couldn’t even tell they were there, so I would add more next time. This recipe is a keeper. I just got NT last week and have a raw milk guy, have made whey and started pickles and all that – but my sourdough starter got all mold-ie this morning! (well overnight I guess) Is it bad!? I just mixed it up and added the cup of rye flour – thinking if its good…Im good, but If not – its a cup of flour lost – oh well. I want to try these….but dont want any sick kids…Love your blog and ideas! Makenna – You should skim the mold and then feed again. If it appears again, or keeps appearing, then I’d say your starter is overcome by mold and you’d be better off starting again. What is the best way to start a sour dough culture. I have been given some in the past that had been kept going for over 100 yrs! Makes beautiful bread, but alas, I dont use it enough to keep it going. It goes off in frig after a month or so. I can only tolerate a slice of sour dough bread once a week. Gwen – I haven’t made my own sourdough starter. I use the New England starter from Cultures for Health (http://culturesforhealth.com). We love waffles and want to try this recipe out soon, but I was wondering about the waffle maker. From what I can tell in the photograph above, it looks like you’re using an electric maker that has cast iron plates? The only electric ones I’ve found are teflon coated! In searching for cast iron waffle makers online, it’s the stovetop/ campfire variety, which I’m thinking of purchasing. Any thoughts from Wardee or any others are appreciated! I am still working on the seasoning and hope that when I get it right (it is so tricky w/ all those grooves) that they will work well. They are tricky in that they come apart and one of my burners is bigger than the iron. Thanks for the efforts you have put in to educate people about real food. Love your site! I am new to waffle making. Could you recommend a good waffle maker? If possible, also a sandwich maker. Ones that are non-stick. Thanks for your reply on the waffle maker. Would like to ask how do you wash it before first use and how do you maintain it thereafter? Is there anything to watch out for when using the waffle maker? Hi Erin or Wardee , my waffles did not turn out crisp. Can you tell me why? Hi Veronica- Hmmmm. Maybe your starter was too thin? Is your baking soda fresh? Maybe your waffle iron not hot enough? Did you alter the recipe in anyway? If you’d like to give me a bit more info., I’d love to throw some ideas your way! Thanks! These were wonderful! So easy and very tasty. .-= Rebecca´s last blog post… If you register your site for free at =-. Okay, so I am new to using sourdough starter, and may have oversoured my stuff by always mixing back in the “hootch” that separates out on top. That being said, I also think that my starter was too runny for this recipe–they all ran right out the side of the waffle maker, and didn’t rise very well. However, since I had 6 cups of starter, I had three batches to perfect it, and ended up flipping over my waffleiron just a few moments after closing it–it definitely helped. BTW, because of the baking powder in the recipe, I personally wouldn’t recommend doubling or tripling the batch or the baking powder may lose it’s “umfph” before you get halfway through the batter. It mixes and measures up quick though, so one batch right after another was no sweat. Wonderful recipe, and I definitely could taste the sour, although the family didn’t slow down long enough to notice that part. They just love it when I make them waffles! Thanks for sharing the recipe; it’s great to have another option than to “discard” starter–I simply feed the batch and feed it again until I have 1/2 cup to set aside and then use the rest for this recipe (or whatever other recipe I’m making that requires it… LOVE the sourdough English muffins!!!). 1. So glad you are loving the english muffins! 2. I think you are right when it comes to doubling and tripling the recipe. Because you only make one waffle at a time, there is a good deal of waiting. Better to make one batch at a time. 3. I also think you make a good point about the starter being too thin. The night before you make the waffles, you might want to try feeding your starter a bit more flour than normal to make it a thicker consistency. Maybe you could give that a try next time. If you do, be sure to report back! -Do you keep your starter in the fridge or on the counter? -How often and much do you feed it? -How often do you use it? Thanks for taking the time to comment, Dani! I’m happy to share with you–and as a newbie, I’m always open to suggestions, too! I am not able to bake as much as I’d like–I have to limit it to weekends, and not even every weekend at that. Because of this, I feed my starter until I have as much as I’m planning on needing for whatever is on my baking agenda, and then into the fridge it goes after it gets domed and frothy. So, this morning’s waffles were refrigerated, but I did drop the bowl into a sink of warmish water to revive the starter before making the recipe. It did “warm” up (I wasn’t trying to heat it, but rather to just take off the chill. I made some waffles with coconut oil one time and when I poured the warm oil into the cold batter… well, let’s just say it didn’t mix very well!) quite nicely, and had actually foamed up a bit again. One more thought, and then my tip for the day: I definitely overwarmed my butter/coconut oil This certainly would have contributed to my runnier batter. So, in between waffles, I shoved it in the fridge to thicken a bit. Didn’t spend much time in there, since the runnier waffles cook pretty quickly, but it did seem to slow down the rise of the baking powder. Otherwise, when I’m feeding it, I try to do it morning and night to build up to have as much starter as I did this morning. I have been able to use my starter about every two weeks, with intermittent feedings in between. Oh, and bonus for me: I caught my own wild yeasts and my Carl’s (that I was so sure I was going to need) is still in the freezer! I do think I will begin pouring the liquid off as it separates, because everything I have made is REALLY sour. And definitely, I will start with less starter, and feed the night before, a drier mix so they’re not so runny, the next time I make waffles. Thanks for the encouragement, Erin! Just made these this morning. My batter was very thin- is this normal? I kept my sourdough on the counter, feeding it a 1/2 cup of sprouted rice flour and water every 8-12 hours, until I had 4 cups. I also used an electric Belgian waffle iron and after cooking, the waffle seemed a bit “rubbery” and thin (not the thickness of a Belgian waffle). If I added more batter, it ran out of the waffle iron. Delia- Thanks for your comment. Maybe you could try feeding your starter a bit more flour than water for a thicker consistency the next time you make these waffles. Also, I am not familiar with gluten free starters and wonder if the sprouted rice flour makes the batter behave differently. I’m glad they had a nice taste, but I sure would like to help you get a crispy and not-so-thin waffle. Let me know if a thicker starter helps things! I make my own pancakes (not sourdough because I am so new to it that don’t even have any starter yet) Anyways I use the same recipe for waffles. Has anyone ever tried to make pancakes with this recipe? I just made this and used the batter for both pancakes and Belgian waffles. The pancakes were nice and fluffy and the waffles were great too. I think I liked the waffles better though. I used coconut oil so they were dairy free and I did add extra flour to make the batter thicker because my starter was a bit runny. Okay….I made these waffles this morning and let me just say that I wanted to weep with happiness. I have a question about sourdough starter – if I feed it up to use it, then take off say half for my recipe, do I need to feed it again straight away? I’m self taught and I’m not quite sure when to feed it in relation to using it. Thanks. I’m a week into sourdough and already loving it so very much!!! I’ve made pancakes almost all week and today made these waffles. My kids gobbled them up so quickly and my husband, who normally prefers savory things for breakfast commented 2x on how great they are! So exited to make them again!! I love the recipe and it’s my favourite waffle recipe. I have always measured out my starter without stirring it before. Just wondering if the starter should be stirred down before measuring out the 1 cup? I convert most recipes to weight, because it’s so much quicker and easier to bake using weights. Hi Heidi- So glad you enjoy the waffles! And to answer your question, I never stir down before I measure one cup. I just take my one cup measure and scoop it straight from my crock. I have one question about this recipe…. I about live on your english muffin recipe but for that I use starter that’s 100% hydration (fed 1 part water to 2 parts flour by volume) but all my other waffle recipes use 166% hydration starter (equal parts water and flour by volume). My starter is desem, 100% whole wheat and pretty thick at 100% hydration. It’s very pourable at 166%. Which starer should I use for these waffles? I was kinda doubtful about using my starter at 100% hydration but the waffles came out fantastic. These were far and away the best sourdough waffles I’ve ever made. I work in a residential home for kids aged 6 to 14 and these waffles were a hit with all of them (and pleasing all of them about *anything* is nigh on impossible!). Thank you thank you thank you!!! Earlier this week I used your waffle recipe without the butter and made funnel cakes. They turned out great and were, of course, a big hit. Tonight for dinner I made the recipe without sweetener, vanilla, or cinnamon and ladled chicken pot pie filling (made in the crockpot) over top. This will no doubt become the a favorite meal and it was soooo easy. Sourdough, whole grains, and LOTS of veggies – what’s not to love! Thank you so much Erin for this recipe. I really need to save up so I can buy the eBook! Hi Jan- You are very much welcome! Your dinner idea sounds delicious. I’ve even had success adding cheese and spices to the waffles. Yum! I am confident you’d really enjoy the eBook! Enjoy your weekend! These are the best waffles! I make them all the time! No, I have not tried these waffles in the savory form. Years ago I made a savory waffle that had a sauce with it. I think they were broccoli….and really good. I’ll have to give the savory sourdough ones a try. I’ve been making these for about a year and I just wanted to thank you for such a great recipe! A few months ago, when I didn’t have enough starter, I tried a different recipe and it was a miserable experience! My whole family loves these — no need for another recipe ever — and I freeze any leftovers and my boys love having them for snacks. I have three starters going at all times; Spelt, Kamut, and White Wheat. I usually combine the Spelt and Kamut starters when making waffles. These produce a milder flavor than the whole wheat. We love them with butter, homemade blueberry syrup, maple syrup and banana slices. How much flour and water should I use to get 2 cups of starter? It takes a week plus to get your starter going to the point of making waffles but these (and pancakes) are great things to make with a new starter. Have fun! Hi Erin – I just came across this waffle recipe this week and tried it. Because of sensitive skin and tummies our children don’t eat wheat. I made these with spelt, and let the sourdough sit out for two days (by accident) instead of overnight and they turned out absolutely wonderfully. I won’t go back to my old favourite recipe (which was good) since this one is heavenly. thank you! Thank you so much for sharing this recipe. I had an abundance of leftover starter sitting on my counter since yesterday, unfed. This was the perfect use for it! I went the honey/vanilla/cinnamon route, and the whole family agrees they agrees the best waffles we’ve ever eaten! I’m making a 2nd batch to freeze. A dear friend from Alaska gave me a 100 year old starter from there. She loves making waffles with it. I will have to try. These are now our favorite waffles–light, fluffy, and crisp! So good! Another great way to use my sourdough starter! My old sourdough waffle recipe had good taste, but tended to be dry, heavy, and dense. Thank you for sharing this recipe! Can you substitute the egg with something else? I would like to make a grain free sourdough starter and then a non grain sourdough bread… does anyone have a receipt for both?